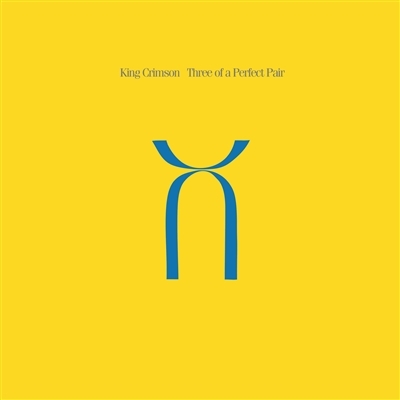 Three of a Perfect Pair is the eleventh vinyl release in the King Crimson classic LP reissue series. Having released two albums in a nine month period between October 1981 and July 1982, “Three of a Perfect Pair” is the final part of the recorded trilogy begun with “Discipline” and “Beat”. Originally released in April 1984, from the pointillist minimalism of the title track through to the urgent rush of ‘Sleepless’ and the album’s closer ‘Larks’ Tongues in Aspic III’ - the only reference to the 1970s incarnations of the band – Crimson’s distinctive mixture of rock, electronica, funk and pure pop songs, ensured the group’s status as one of the most interesting and innovative bands of the decade. Following the release of the album, the band embarked on a tour of Japan and from there America and Canada. At the completion of the last date in July 1984, Fripp, Bruford, Levin and Belew went their separate ways to pursue their respective solo commitments. King Crimson would reconvene in the mid-1990s with a double trio line-up featuring all of the 1908s band members, while the band’s current line-up (2014 – present) features both Robert Fripp and Tony Levin from the 1980s band. The simultaneous release of Three of a Perfect Pair and Beat completes the availability on vinyl of all King Crimson studio albums from 1969 – 1984 for the first time since the late 1980s and with all titles manufactured on 200 gram vinyl and cut from masters approved by Robert Fripp, they have never sounded better in the 12” format of their original release.